Stretch marks are skin-induced changes due to its internal micro-rupture due pregnancy, sudden weight loss, hormonal changes, and the skin over-exposure. Almost complete removal of the stretch marks was possible with the appearance of fractional lasers. 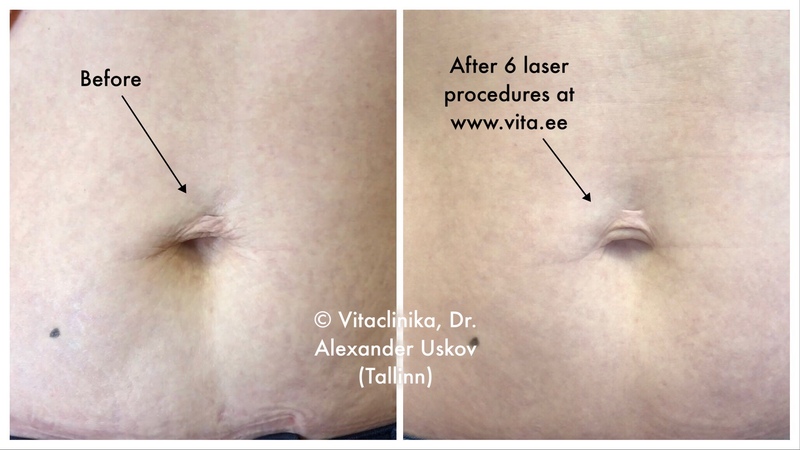 Vitaclinika doctor has been involved in the removal of stretch marks since 2002. We have accumulated and systematised a lot of experience in this area. Women are the most common cause of stretch marks after pregnancy and childbirth. Men also have stretch marks, they are often associated with professional sports. Stretch marks may be present at the age of 15. The tendency to stretch marks is genetically inherited. Typically, stretch marks do not pose a health risk, but they may be symptoms of serious illnesses, especially when stretch marks appear in adulthood. Stretch marks cause severe psychological discomfort and lower life quality, because they are unethical and difficult to conceal with anything other than clothing. Other stretch marks types are less common. The usual colour of the stretch marks is from white to purple. Almost always stretch marks are pigmented heterogeneously and different from the surrounding skin. The stretch marks of different zones are structurally different, which the physician takes into account during treatment. Young stretch marks arose are less than 6 months ago, older stretch marks are called old. Intense engagement with different types of body and body cultures and a sudden increase in muscle mass causes stress in the skin that can cause stretch marks. In order to prevent them, it is recommended to increase the load gradually, while constantly applying a moisturising and nourishing cream to the skin. Young mothers are at risk of stretch marks. Due to the hormonal changes in the body and the sharp increase in abdominal circumference, almost 90% of young women have stretch marks. From the first days of pregnancy, it is necessary to use anti-stretch marks cream, moisturise and nourish the skin continuously. Particular attention should be paid to therapeutic exercises to keep skin elasticity. It is recommended to use special supportive bandages and bras. However, even with the most careful skin care during pregnancy, unfortunately, there is no guarantee of stretch marks. Regular irrigation of the skin is one of the methods for minimising stretch marks. Regular use of anti-ageing creams keeps them from appearing, but stretch marks are less pronounced. Attention! On the Internet, you can find ads for miracles that allegedly remove stretch marks. Unfortunately, this is not true and such advertising is a scam: medical creams or gels can not be released from already existing stretch marks. Several cosmetic companies produce creams for stretch marks: «Sanosan» stretch marks removal cream, «Collistar Anti-Stretch Marks Cream», «Dr. Nona SOLARIS», «Clarins Stretch Mark Control Cream», «Lierac Phytolastil», «Vichy» stretch marks removal cream, «Avent» stretch marks removal cream, «Pregnacare» stretch marks removal cream, «Mustella» and «Mama Comfort» stretch marks removal cream. Cosmetological methods are not very effective, but before the laser methods appeared, they were widely used: they are talcotherapy (wrapping) and ozone therapy (ozone injections). These methods are in the background in connection with the advent of modern fractional lasers. Unfortunately, cosmetological methods do not help the old stretch marks. How to remove stretch marks with laser? 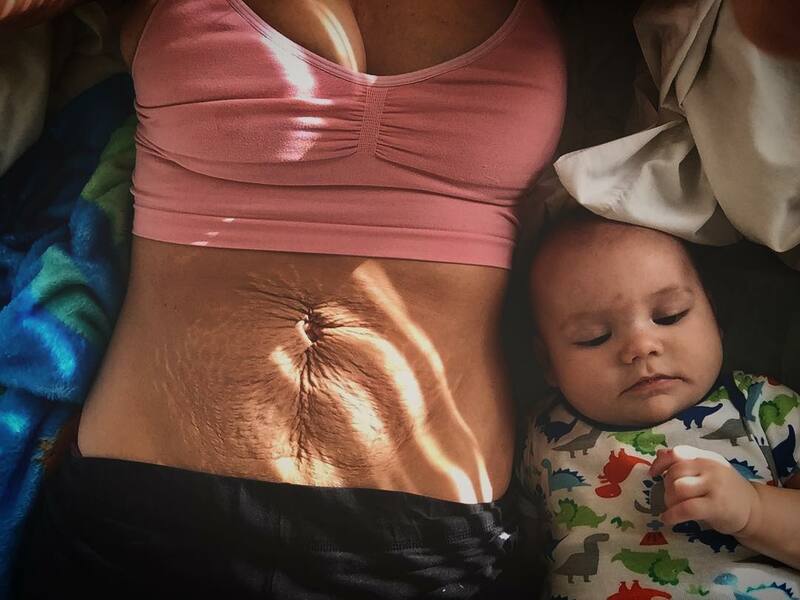 Unfortunately, if stretch marks are already formed, they will not go away. Like ordinary scars on our body, do not tend to retract the stretch marks. However, they can be greatly reduced and transformed by laser. Which methods are used to remove and reduce stretch marks in Vitaclinika? Vitaclinika uses several methods to remove stretch marks. The choice of a particular method or combination of these will decide doctor at a consultation. Vitaclinika uses modern laser equipment (Lumenis Ultra Pulse Encore, Nano-Fractional CO2 Laser, Q-switch Nd: Yag laser, Lumenis M22, etc.) to remove stretch marks. The methods are chosen according to age, patient’s history, type and stage of stretch marks, the incidence of concomitant diseases, skin condition, pigmentation of stretch marks, blood vessels in the scars, and other factors. During the fractional stripping procedure of the stretch marks, hundreds of nanoperforations are performed on the skin, skin regeneration and collagen synthesis are initiated. As a result, the skin tightens, becomes thicker and more elastic, the thinness disappears, the size of stretch marks decreases significantly with each procedure, they become less noticeable. 30-50 minutes before the procedure doctor applies anaesthetic to the skin. The procedure lasts 15-30 minutes. Immediately after the procedure the skin becomes red, the reaction lasts for several days. 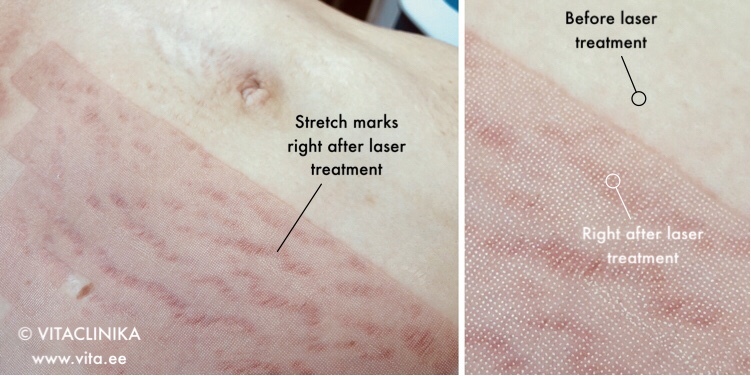 On the photo it is seen how skin is red right after the procedure – stretch marks reacts more strongly to the laser. The patient is given advice on the treated surface (care should not be taken during the two days, it should be treated regularly with dexpanthenol and chlorhexidine, should not be allowed in the pool, sauna, solarium for two weeks, and should avoid massage, tanning and intensive sports for two weeks, it is recommended to use suncream). The next procedure is scheduled for 4-8 weeks, removal of stretch marks consists of 4-9 laser treatments (depending on the degree of skin damage and the individual properties of the body). During treatment, your doctor may advise you to add additional methods of treatment, such as removing pigment from scars, if necessary. The passing of a surgeon does not impose significant restrictions on the patient’s habitual way of life and can be done at any time of the year, but carefully following the doctor recommendations. Vitaclinika removes stretch marks in specially equipped medical rooms. 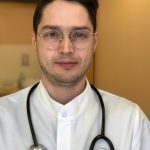 The procedure is performed only by medical staff registered in Estonia with higher medical education and certified to use the equipment in the EU. Our clinic uses additional equipment and special processing methods, which is our know-how, to further prevent complications, to increase efficacy and to treat the pain. Check out the price list for stretch mark removal here. Question: Can the stretch marks be removed so that nothing stay on the skin? Doctor’s answer: No. The stomach is a bond of connective tissue inside the skin, so even with the ideal external cosmetic result, if the stretch marks are not visible to the eye, the arm remains in the skin. Question: When I remove stretch marks and get pregnant later, will they appear again? Doctor’s answer: Yes. Stretch marks are our skin defence mechanism, because at the expense of micronutrients, the skin can prevent complete rupture. Therefore, stretch marks may reappear in pregnancy, abrupt weight gain or severe hormonal disorders. Question: I have already removed stretch marks once after the first pregnancy. Is it possible to do this procedure again after the second birth? Doctor’s answer: Yes. Procedures can be repeated several times. Doctor’s answer: No, the procedure is painless. Anesthesia is applied to the skin 40 minutes before the procedure. Question: Is the result permanent or should the procedure be repeated later? Doctor’s answer: The result of the procedure is stable and stretch marks do not come back unless the patient’s body weight increases, he will not be born or undergo hormonal changes. Question: In other clinics, the cost of removing stretch marks is higher. Why are you cheaper? Vitaclinika director’s answer: The problem with stretch marks is very unpleasant, especially for women. We want to make this important service massive, so we have separate equipment for this in 2018. We hope that due to the large number of patients, we can keep prices low so that as many women can return to their normal way of life, wear beautiful dresses that they like.